As I'm sure a lot of you have seen by now, there are at least a few cards that have really stood out in the past couple months from the Invasion Earth set. We've still haven't seen a lot of mainstream success with cards like [ccProd]Almighty Colossus[/ccProd] or [ccProd]Dark Seer Jurlon[/ccProd], but for all we know, there could be cards yet to be released that make these cards even more playable than ever before. But until that happens, we'll just have to focus on the present, after all, everything else is still speculation. For this week's article, I want to take a look at some of the most underrated cards in Invasion Earth. These are the underdogs, the underplayed. The cards that tend to collect dust in a random 800 count card box until someone decides to try something new and innovate. It's at that point that some may start to see the playability of these and realize that they're in fact really good cards... technically speaking. [ccProd]Detain [/ccProd]is one of the lowest cost spells in the game sitting in at one mana. Giving you the ability to tap down one of your opponent's creatures is always beneficial when you have a creature that can capitalize on the situation and either go for a shield or take down the tapped creature. This card pairs really well with cards that gain effects when winning a battle, such as [ccProd]Herald of Infernus[/ccProd]. For a period of time when [ccProd]Eternal Haven[/ccProd] was running more rampant then it ever was, a few players started using spells that didn't target a specific creature like [ccProd]Devouring Smog[/ccProd]. This card essentially lets you tap down [ccProd]Eternal Haven[/ccProd], [ccProd]Tricky Turnip[/ccProd], [ccProd]Keeper of Laws[/ccProd], and even [ccProd]King Neptas[/ccProd], assuming that that creature is the only one currently untapped. 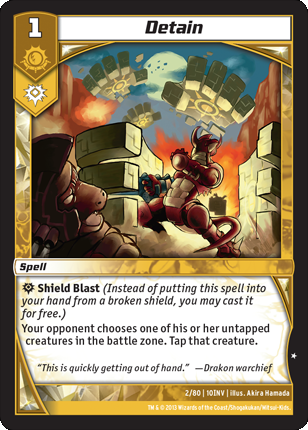 Add to the fact that this card is a shield blast and tapping down a Haven becomes even more plausible. After all, most players usually want to swing in for game with [ccProd]Eternal Haven[/ccProd] last since they know they won't have to worry about most shield blasts outside of Stormspark Blast. This cards' strength is also it's greatest weakness. If for some reason your opponent doesn't have an untapped creature, you're left adding it to your hand. On the other hand, your opponent might just have too many creatures in the battle zone. This would allow them to tap whatever creature can't attack or an extra one that they don't readily need. Honestly, I'm surprised that we haven't seen more of this card in our current metagame. A blocker that can get rid of a threat on the board and block an attack on the following turn seems like a decent level of value. Pair this card with all of the other bounce and tempo-type cards like [ccProd]Rusalka, Aqua Chaser[/ccProd] and [ccProd]General Finbarr[/ccProd], and you have yourself turn after turn after turn of bouncing shenanigans. Being able to keep your opponent's creatures off the board is important in a high creature focused game when you have other cards swinging in to go for shields like [ccProd]Aqua Seneschal[/ccProd], [ccProd]Tricky Turnip[/ccProd], [ccProd]Keeper of Laws[/ccProd], and so on. 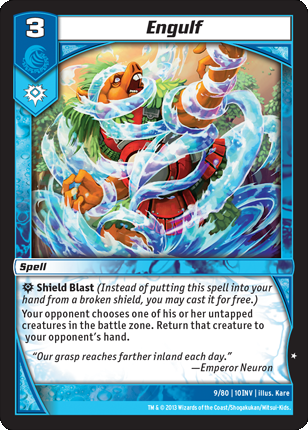 This card also fits really well into a Megabug deck utilizing water as one of it's sources. Being able to swing in with [ccProd]Hive Queen[/ccProd], drop a blocker and bounce one of their creatures back to hand is disruption at it's finest. Very similar to [ccProd]Detain [/ccProd]in just about every way, [ccProd]Engulf [/ccProd]gives us a little more bang for our buck. Instead of tapping a creature, this card will bounce a creature back to the owner's hand. With no level restriction, this card acts like a [ccProd]Veil Vortex[/ccProd] but for three mana and it gets around the "this card cannot be targeted by your opponent's spells or abilities" clause since your opponent will have to choose an untapped creature to return back to their hand. If your opponent isn't summoning more than one creature or getting aggressive by attacking, this becomes an easy form of removal that can deal with problematic cards like [ccProd]Eternal Haven[/ccProd] or simply allow your other creatures to achieve successive and consecutive attacks against your opponent. 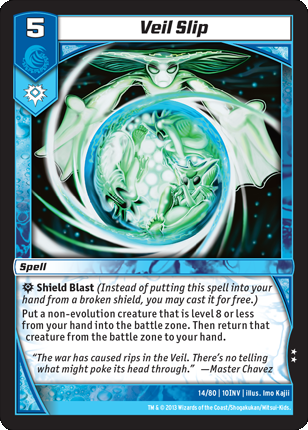 I'm really excited to see [ccProd]Veil Slip[/ccProd] take off as a popular deck tech choice. There are numerous cards with "enter the battle zone" abilities that would be amazing on a level five shield blast. Cards such as [ccProd]Vile Malvictus[/ccProd] or [ccProd]King Coral[/ccProd] become potential board wipes/bounces, while being able to "blink" in a card like [ccProd]Megaria the Deceiver[/ccProd] to successfully gain her ability multiple times in a game can get a little bit ridiculous. Realistically speaking, you don't need to bring out the big guns every time you play this card. If this card is broken by someone using a rush strategy, you can always bring out a [ccProd]Rusalka, Aqua Chaser[/ccProd] or even [ccProd]Screeching Scaradorable[/ccProd]. Why stop there? You could even bring out cards that you don't have the mana colors for like [ccProd]Necrose, Nightmare Bloom[/ccProd], allowing you to get another potential creature out to the board with their own potentially devastating effect. Originally when I first saw [ccProd]Shadow Strike[/ccProd] I had high hopes for the card. A card that has the potential to weaken a creature's power level by one of your strongest creatures power levels is nothing to scoff at. In fact it's possible to realistically lower your opponent's creature's power level by 4,000 all the way to 17,000; in unique circumstances you can lower the power level even more than that! 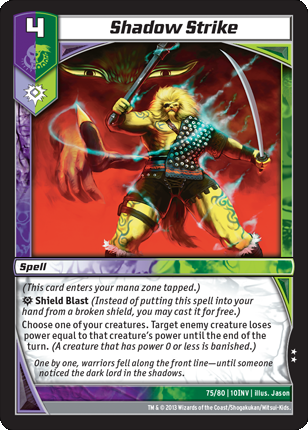 This four cost spell essentially becomes another copy of [ccProd]Terror Pit[/ccProd] as long as you have another beefed up creature in the battle zone. 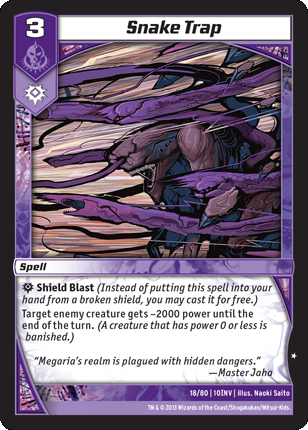 In the case when you don't, this card often becomes dead weight in your hand and I assume that this is the most common reason that [ccProd]Shadow Strike[/ccProd] hasn't seen any competitive play. If you combo this card with some slightly bigger creatures like [ccProd]Lyra, the Blazing Sun[/ccProd] or a less popular choice of [ccProd]Rupture Spider[/ccProd], you could potentially replace cards like [ccProd]Snake Trap[/ccProd] or even [ccProd]Bone Blades[/ccProd] if you're willing to push for the "high risk, high reward" tactics. [ccProd]Snake Trap[/ccProd] was a card that the darkness civilization really needed. A turn three spell that can deal with some of the most annoying creatures in the game, [ccProd]Lux [/ccProd]and[ccProd]Nix[/ccProd]. Being able to disrupt a player's set up with dragons is important in order to come out on top. If they get out bird after bird progression, you're already in a losing position. A good deal of people still use [ccProd]Toxic Fog[/ccProd] to deal with smaller creatures, but it doesn't do anything against Lux. Snake Trap can easily dispose of that turn three Nix and put your opponent back a turn so you can play a [ccProd]Bone Blades[/ccProd] or [ccProd]Screeching Scaradorable[/ccProd] on turn four to deal with[ccProd]Lux[/ccProd]. 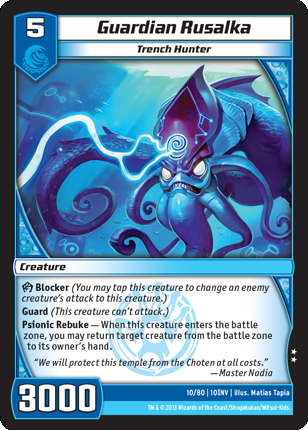 Outside of the dragon match-up, this card can deal with [ccProd]Aqua Seneschal[/ccProd], [ccProd]Scaradorable of Gloom Hollow[/ccProd] and random other cards that could be used for "evo-bait" down the line. That's going to conclude it for my first installment of "Technically Speaking," but stay tuned next week when I take a look at a few more cards that have the potential to be great cards in the right situation and the right deck. Maybe you might give some of these cards a try at your next local or perhaps your next KMC? I'd love to hear your experiences about the cards that were discussed today, so feel free to let me know what your thoughts are about them in the comment section below! Until next time everyone, this has been Mark Woodin, and as always, remember to keep calm and game on!